Lock in a great price for Montgomery Marriott Prattville Hotel & Conf Ctr at Capitol Hill – rated 9.4 by recent guests! This size of the room and the view of the golf course. The hotel was so beautiful, and our room overlooked the golf course. It was great to have the restaurant on site at the end of a long day of traveling! The food and the service were excellent. We were all tired at the end of a busy travel/museum viewing day. It was particularly appealing to enjoy a good meal “in place”. 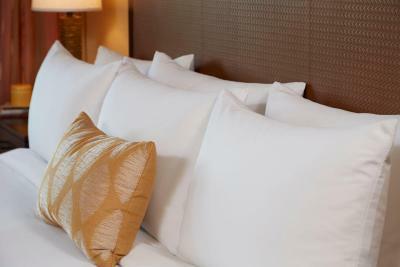 beds were soft and comfortable, maids were extremely helpful, dinging room staff was very attentive, eager to please. Front desk very pleasant, would recommend. Nice big room. Nice restaurant and lounge overlooking the golf course. Great entertainment that evening by Ben Norris! The beds were very comfortable, linens were very soft. Everything was great. I will be looking forward for another stay. Beautiful property! The staff was so courteous, even though the phone was ringing continuously during check in. We stayed during the evacuation of Florida from hurricane Irma, on our way back to Chicago area. Our 14 hour car ride just to get out of the state of Florida was exhausting but when we arrived at the hotel it was a perfect end of the day. Room was spacious and clean and we had a great night sleep on a comfortable bed! Had lunch in the restaurant that next day it was delicious and reasonable for an onsite restaurant. Montgomery Marriott Prattville Hotel & Conf Ctr at Capitol Hill This rating is a reflection of how the property compares to the industry standard when it comes to price, facilities and services available. It's based on a self-evaluation by the property. Use this rating to help choose your stay! In Prattville, on the Robert Trent Jones Golf Trail at Capitol Hill, the Marriott Montgomery Prattville Hotel and Conference Center offers an outdoor swimming pool and an airport shuttle service. Cable TV and free Wi-Fi access are included in each guestroom. For in-room dining, 24-hour room service is offered while refreshing beverages can be prepared with the tea/coffee maker provided in all rooms. Cardiovascular equipment and free weights are available in the well-appointed fitness center at Marriott Montgomery Prattville Hotel and Conference Center. Free public parking is also offered at the hotel. A traditional continental menu of American meals is served at Oak Tavern. This property also has one of the top-rated locations in Prattville! Guests are happier about it compared to other properties in the area. When would you like to stay at Montgomery Marriott Prattville Hotel & Conf Ctr at Capitol Hill? This double room has a seating area, CD player and cable TV. A dramatic departure from ordinary Montgomery hotels, this extraordinary Prattville, AL hotel presents the ultimate retreat, designed to provide the perfect balance of business and pleasure. House Rules Montgomery Marriott Prattville Hotel & Conf Ctr at Capitol Hill takes special requests – add in the next step! Montgomery Marriott Prattville Hotel &amp; Conf Ctr at Capitol Hill accepts these cards and reserves the right to temporarily hold an amount prior to arrival. Montgomery Marriott Prattville Hotel & Conf Ctr at Capitol Hill accepts these cards and reserves the right to temporarily hold an amount prior to arrival. The bed was terrible!.It was hard and uncomfortable. The facilities were very nice. I didn't get the room with a balcony as I requested ,cats were on the property and my $50.00 has not been returned to my card yet what is the hold up I am sure the room has been checked and cleaned by now! there was no machines in the buildings to get snacks or drinks, no nice gift store. Although the wait staff in the restaurant was very nice, service was very slow. The bed was very uncomfortable compared to other hotels. It was open and big. Restaurant food was pretty bad. I had to return a salad. How can you mess up a salad? Lovely place and room. Will return another time.